Steam distilled and bottled in the heart of the Valley of Roses in Bulgaria, Alteya’s USDA certified organic Bulgarian rose water is the world’s most exquisite 100% pure, natural, organic rose flower water. The beautiful fragrance, special qualities and plants synergy of their organic rose water is well known all over the world. Alteya’s pure organic rose water is a therapeutic and food grade product. By using a unique distillation technique, which embodies century-old traditions and modern technology, Alteya distill a special grade rose water that completely preserves the bio-dynamic energy of the rose plant. Flower water 100% steam-distilled from fresh hand picked rose petals. You can use this 500ml size bottle as a refill for the 100ml and 250ml sizes. Alteya Organics was born in 1999 but growing and caring for roses has been a family tradition for over a century, since the early 1900s. Their organic rose fields, shielded by the slopes of two majestic mountain ranges, are in the heart of the Bulgarian Rose Valley, the land of Thracian Kings and home to the world’s finest flower - the Bulgarian Rose. Apply gently with a cotton ball onto face and neck, morning and evening, after cleansing, to tone and refresh skin. Mist it over your entire body after a shower or to freshen up any time for a splash of gentle aroma. Massage the roots of washed hair or use as an invigorating hair rinse. Add a teaspoon to your morning juice or tea. Store away from sunlight, in a cool, dark place. 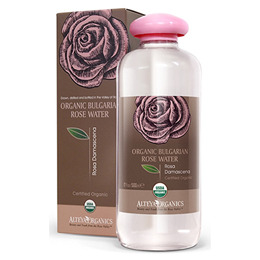 Below are reviews of Alteya Organics Bulgarian Rose Water - 500ml by bodykind customers. If you have tried this product we'd love to hear what you think so please leave a review.